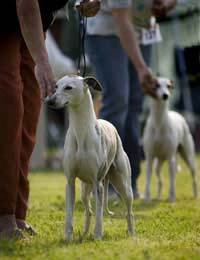 It is usual for outdoor dog shows to have undercover areas for dogs and exhibitors due to the dubious climate in the UK. In years gone by the tents as they are called in dog circles, were very large marquees that could hold hundreds of dogs and their owners. With the weather changing from very wet to hot in one of our usual summer days these could become somewhat muddy, steamy and extremely smelly! There was usually room for several small rings that exhibitors would have to share with many other breeds after fighting their way through the crowds. Many hardened exhibitors will remember the years when high winds whipped through the tents lifting the fabric and ropes into the skies and being pulled back to earth by the willing hands of exhibitors. The tents were often sited away from the outside show rings so that when the sun came out dogs had to be transported across the quagmire to reach the designated show ring. It was not unusual to see large, heavy coated dogs being hung around their owners necks in order to keep them clean before being inspected by the judge! At the end of the day, the show ground, no doubt churned underfoot by so many exhibitors had to be crossed again to reach the car park. It is not unknown for cars to be stuck in the mud and needing help to be released. In certain instances the army have stepped in to rescue and tow out the stranded dog owners. The funniest sight is to see dogs still pristine, without a speck of mud near their groomed coats, and owners covered in thick crusted mud – such is the dedication of a serious dog exhibitor. In recent times the tent designs have changed, with room for plenty of benches and rings that are designed to be half in and half out of the tent. The breeds will not have to walk far from their benches to reach their ring and if it should rain the judge simply uses the covered part of the large show ring. It isn’t just the wet rainy weather that the covered rings are used for. With the climate changes affecting our summer shows, many times the inside rings are used on the hotter days of the year. The people who are adversely affected to these new style rings are the many trade stand owners who are present at each show selling their canine wares. Their stands were always set up around the ring area attracting the attention of exhibitors sitting ringside. Nowadays they are more reliant upon dedicated shoppers as show regulations state, no dog should be away from its bench for more than 30 minutes unless it is being shown or exercised. Many owners will not risk leaving their dogs unattended just to go shopping. Benches are normally provided at the larger championship shows and this will be indicated in the show schedule. The bench and tent number will be shown on the pass for each dog and are usually sent to the exhibitor several weeks before a show. If not, a show official will be on hand to tell you in which tent your breed can be found. Collect your catalogue from the stand just inside the show ground and look for your dogs ring number – this will also be his bench number. Upon entering the tent designated for your breed you will find that the benches are numbered chronologically and are arranged in long aisles. You will always be benched near to the same exhibitors as entries are also listed and benched alphabetically by the exhibitor’s surname. Within each tent there is a grooming area where exhibitors can set up their grooming tables if there is not room in front of the bench. The bench is raised from the ground with a wooden base, the back and sides are of a metal construction so that each dog cannot see its neighbour. The bench number is displayed on the top of the back-board alongside an identical card which will be the dog’s ring number – remember to attach this to yourself before you go into the ring.For shows that run over several days the benches are cleaned and disinfected each evening. There is a metal ring at the back of each bench for your dog to be attached to the bench for safety. A special ring chain can be purchased that will clip to your dog’s collar and to the bench. Benches vary in size from breed to breed. Some smaller breeds have cages fitted whereas the giant breeds are sited on the ground. Remember to carry a small blanket for your dog’s bench as it is a hard surface to sit on all day. Many owners perch themselves on their dog’s bench and tuck any bags underneath – bench areas make a good base for lunch and chatting to friends. When searching for someone on a large show ground always start at the benches – they will appear there at some point. A fresh water point should be sited near most tents.